Customer Reviews For "Against the Tide"
An uplifting and inspiring tale of the Father's ability to turn all things for good in His perfect timing. Courage. 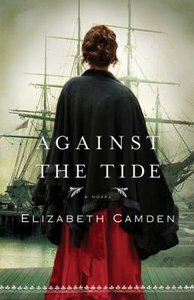 spoiler alert  I enjoyed Against the Tide generally. The story was interesting and different and seems well-researched. However, I found it difficult to warm to the characters. I had already encountered Alexander Banefield and he was fascinating but his continual stubbornness and the blatant way he uses the woman he loves made it difficult to warm to him. He does redeem himself in the end but my problems in trying to engage and care about the characters didn't abate. I do think it was well written and it is an interesting story so it may have just been a personal thing. They didn't gel with me but they might with someone else. I have never actually finished reading any book of Camden's before, although I have started reading one. So it is safe to say I had no idea what to expect. And my speculations certainly could never have lived up to the standards of this amazingly crafted story that is just brimmed with suspense, romance and history I had no idea about. Bane and Lydia hadn't even met yet and their attraction for each other was evident. With Bane's annoying and flirtatious nature and Lydia's perfect and need for control, it was clear from the beginning that this is going to be a relationship enjoyable to watch, which it was. As the story progressed it was clear that they were a match made in heaven, completely perfect for each other. When times got tough, the care Bane bestowed upon Lydia was just something able to be dreamed of. However strangely enough it wasn't my highlight of the novel. What really captured my attention with this novel was the history Camden revealed about the opium trade and how powerful it was, as well as the dangers taken to prevent there sales, or the struggle that is needed to overcome its addiction. I loved how Camden made this the focal point of the novel, which was followed by the dangers Bane and Lydia had to embark for the general good of everyone. Camden also wrote the book in such an interesting manner that I felt I got to know Lydia and Bane in a personal way. Although at the beginning the first couple chapters were about their childhoods and I kept on thinking "What is this going to be good for? ", it paid off in the end (as it always does!!) because it gave me an understanding of what shaped them to be the person they are today, where sympathy was especially evoked for Lydia. Overall I just love the rich information this novel provided and I can definitely see myself reading it in the future!! For those interested in a history lesson regarding the opium trade of America in the 1800s, then I highly recommend this novel, especially if you also enjoy your romances.